Spinal stenosis occurs when there’s a narrowing of space in the spine which in turn causes pressure on the spinal cord and nerve roots. This typically takes place in the lower back (lumbar), though it can occur in other parts of the spinal cord as well. There are several reasons one might develop spinal stenosis. Age – People tend to develop this condition in their 50’s or 60’s. 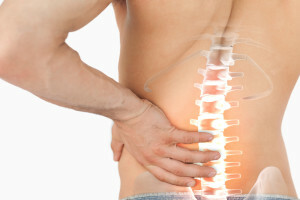 Arthritis – Both osteoarthritis and rheumatoid arthritis can affect the spine. Heredity – Some people are born with smaller spinal canals or scoliosis which makes them more inclined to develop spinal stenosis. Trauma – Injuries can dislocate the spine and cause damage to the spinal canal. Tumors – Tumors can cause harm to the spinal canal via inflammation or growth of tissue into the canal. 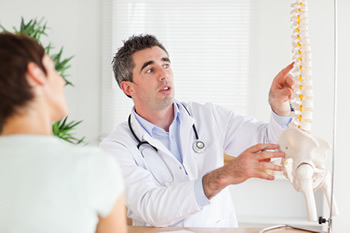 It is important to meet with a specialized spine doctor to determine what the issue is. Your doctor will conduct a physical examination. They might also employ the use of X-rays, MRIs, CAT scans, myelograms, or bone scans to determine what exactly is causing your discomfort. Once your condition has been diagnosed as spinal stenosis, a treatment plan will be formed. Nonsurgical treatments are considered first and include NSAIDs (e.g., aspirin or ibuprofin), corticosteroid injections, anesthetic injections, and analgesics to relieve pain and reduce inflammation. Your doctor might also prescribe restricted activity, exercises and/or physical therapy, and a lumbar brace to help support the affected spine area. If these treatments are not enough or you are experiencing numbness, your doctor may consider surgical treatments. Surgery is used to relieve pressure on the spinal cord and nerves. The most common type of surgery to treat spinal stenosis involves removing the diseased parts of the spinal cord to alleviate pressure and get the spine back to proper alignment. If you think you are experiencing spinal stenosis, it’s best to see a doctor as soon as possible. The Spine Center at the Orthopaedic Associates of St. Augustine is proud to offer our patients the best team of spinal doctors and surgeons in the area. We take the time with our patients to sit down and discuss what is going on, so that we can figure out a treatment plan that will get you back in great shape in no time at all. If you’d like to make an appointment, you may request an appointment online or call 904-825-0540.